1 Thessalonians 5 to me is one of the most effective passages in the Bible – particularly the final exhortations that consists of several short but important commands stringed together in a single line of thought. I like short verses simply because they are easy to remember and thus easy to recall, and words are wonderful – 1 Thessalonians 5:16-28 is one of the best examples of short phrases that are each packed with layers and layers of meaning. Today we’re not going to look at layers, but through 1 Thes 5:24 we’re looking at a different way of saying the same thing that Paul has often said throughout his epistles. In a way, we’re going to simplify an already simple verse through three main points. God calls us. God is faithful. God works. The one who calls you – Who? Pretty obvious here, but just to be sure, let’s cross-refer a little – God is faithful, who has called you into fellowship with his Son, Jesus Christ our Lord [1 Cor 1:9] – it’s basically a longer, expanded version of the first part of 1 Thes 5:24. We know who is the one who has called us, since we are exposed to the whole Bible, and to us it’s kind of a no-brainer. But what about his immediate audience? What about the people from the church of Thessalonians? Do they really know? Well, they ought, because Paul had stated earlier in the same chapter that they have been encouraging, comforting and urging you to live lives worthy of God, who calls you into his kingdom and glory [1 Thes 2:12]. So we know who called us, how about what we’re called to do? From the two verses mentioned earlier, we have been called into fellowship with Christ Jesus, we’ve been called into the kingdom of God; we’ve been called into his purpose [Romans 8:28|Article], we’ve been called into his eternal glory [1 Peter 5:10]; we’ve been called to live a holy life [1 Thes 4:7, 2 Tim 1:9]. These are just some more clear-cut examples – there are certainly tons of other verses that are about God calling us without being so explicit. 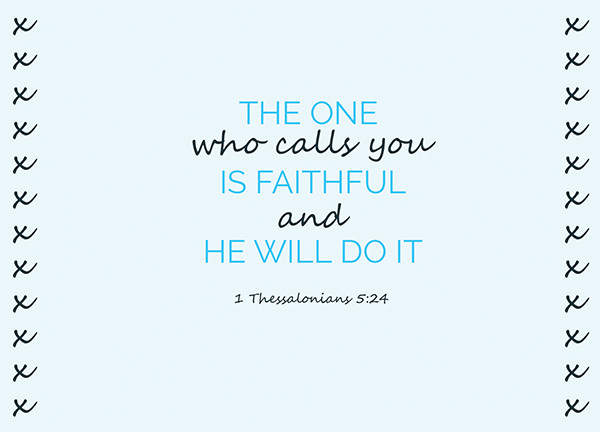 is faithful – If the first part of this verse was kinda obvious, this should be downright clear. We shouldn’t have doubts about God’s faithfulness – we shouldn’t even forget it – throughout the Bible, men have proclaimed God’s faithfulness; God has portrayed his faithfulness, people have witnessed about God’s faithfulness. Right all the way back from the time of Moses – Know therefore that the LORD your God is God; he is the faithful God, keeping his covenant of love to a thousand generations of those who love him and keep his commandments [Deu 7:9] to the time of Isaiah – “Kings will see you and stand up, princes will see and bow down, because of the LORD, who is faithful, the Holy One of Israel, who has chosen you.” [Isa 49:7] to the time of Paul – if we are faithless, he remains faithful, for he cannot disown himself [2 Tim 2:13]. We’ve been so clearly told, so explicitly reminded; we’ve read so many times these three words ‘God is faithful’, we’ve seen so many case studies – yet while we may not disbelieve, we often forget. And because we often forget, Paul repeats himself on this point relentlessly. God is faithful. From the time of Adam, Moses, David; to the era of the prophets, to the days of the early Church, and even till today. Nothing about this changes. God is still faithful. and he will do it – If the previous part is very clear, this final part isn’t. We who speak ‘English’ love words like ‘this’, ‘that’ and ‘it’. Half the time we infer by context and we will understand the message that is being conveyed, but often that is how miscommunication happens and misunderstandings occur. Inferring by context is a thin line apart from assumption. What separates the two is the quality of your supporting evidence. This is especially the case when looking at verses, which are often taken out of context, inevitably. After all, it’s not like we can quote the whole Bible, or even just an entire chapter simply for the sake of making a small point. What is ‘it’? Looking at the verse prior to this is the first thing that we must do – we ought to look at the whole chapter or at least the chunk of verses prior to this, but fortunately the verses from 12 -22 has nothing on what God does and instead focuses on what we should do, so we can skip those verses and dive straight into 1 Thes 5:23 – May God himself, the God of peace, sanctify you through and through. May your whole spirit, soul and body be kept blameless at the coming of our Lord Jesus Christ. Two things that Paul desires for God to do – firstly, to sanctify us through and through; secondly, that we be kept blameless a the coming of Christ. That’s ‘it’. Wow. If we think about it, while this may be a short verse, the full, actual-content version of this verse is as follows: God who has called us into fellowship with Christ Jesus and into his kingdom and purpose and eternal glory and to live a holy life is faithful even if we are not since he loves us and he cannot disown himself, therefore he will sanctify us through and through and keep our whole spirit, soul and body blameless at the coming of our Lord Jesus Christ. Short verses are cool and great, but let’s not compromise the depth of the meaning that is imbued with them. Let us learn to patiently understand the meaning and the context behind these verses, and it will be easier for us to apply them in our own lives. Thank God for Paul, because if the word of God that was left behind for us wasn’t simplified, most of us would probably be lost and confused. No one single verse is able to fully contain the wealth of God’s character and what he has done for us, but many different short verses come together to form us a wonderful image of who God is. For today though, let us just remember that God has called us, and he is faithful, and because God is faithful, he will sanctify us. Why is “one” not capitalized? I usually use NIV; and in NIV it isn’t capitalized. Which version are you using? Quite interesting to note that some other versions capitalise ‘one’.